The efforts to save endangered and vanishing species under the auspicies of the UN and WWF is a long struggle - but a lot needs to be done to preserve these mightly and beautiful animals and wildlife like African elephants and rhinos, the Blind Indus Dolphin and the near extinct Snow Leopards only to be found in the rugged and extremely inaccessible mountain areas of Pakistan. Adding to the efforts of the WWF, the US Postal Service is also joining hands by issuing a new stamp with the theme of Save Vanishing Species around the world. 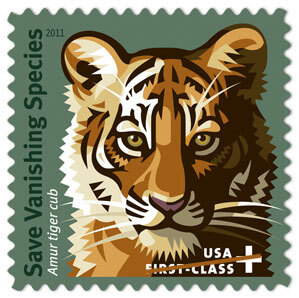 By purchasing these stamps everyone will be contributing to a coalition of great wildlife conservation organizations. The stamp itself has a beautiful drawing of an Amur tiger cub created by Nancy Stahl.